I am proud to present the finished product of countless hours of blood, sweat, and tears. After getting the 2002 Zuma back in May, I spent weeks researching and gathering parts in order to turn a beat up, broken down, junker with 23,000kms on it, into something worth riding around town. But I wanted to make a page for the culmination of all the hard work put in to this thing. Bought from some local kid off usedottawa website. Had been looking for a while but didn't want to spend 1200+ dollars. So I happened to check one saturday morning and this guy had just posted it 20 minutes prior. Not running, 2002, 23,500kms for 250$. Naturally I jumped on it and later that day I was handing over the money and signing the registration paper. What I had bought was a silver/faux chrome junker that had been used as a cottage buggy for the past year and a half and was run into the ground. Plastics were in rough shape, running with open air filter, not upjetted, no engine shroud, I'm surprised the engine hadn't blown up to be honest! Now being in Ottawa, where the riding season is way too short and we need to extend it any way we can, we are forced to drive in fairly cold weather. Knowing I can't avoid it, I decided to get some handguards from the 125s to help ease the cold wind on my hands. Also, after riding in a bit of a wet day, the scoot was getting a lot of mud on the front of it off the front wheel. I had removed the front fender since it was broken but decided to fix it up and re-attach it. I also decided to add a bit of colour with a checked seat cover from http://www.drafseatcovers.com/. It fits like a glove, I highly recommend them. Although the selection is fairly small, the product is really nice! Next I plan on getting the Canadian OEM Windshield and possibly fixing up the luggage rack and re-installing it. Also thinking of getting a new front fender and painting it to match the seat in order to break up the colours a bit. I'd like to thank everyone who has helped in any way with my experience as a budding scoot modder, from advice, to comments, to items I have purchased from you, ect. This forum has been the best source of info that anyone could possibly ask for. But most of all I'd like to thank the 3 people who made the biggest impact on this build specifically. I credit Nifty with putting me in the right direction when it comes to what I wanted to do with this build. With parts, suppliers, info about all different aspects of what to expect with each setup, he was such a huge help at the gathering stage. What can I say about Baka? He has been the technical guru for the entire build process. I can't count the number of nights at work I'll be on the computer messaging back and forth with Baka about everything going on with the build. Parts, tuning, everything that was working or not, Baka was there to help. Without him, I'd probably have this thing blown apart right now, or not even have it running to begin with lol so thanks again!! Anyways, thank you all at Zumaforums.net, I look forward to a great future here and on the road! Killer job. Scoot is sharp. Looking great! Keep us updated! 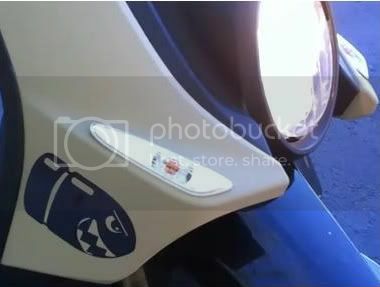 Very Nice - Congrats on a fantastic scooter build! 65mm Forged Piston: Custom Port job on 24mm Large Valve Head: 32mm Koso TB: 10-hole injector: Stock ECU: Stock Cam: Stock Crank/Rod: LeoV Exhaust: Modified Stock Airbox with Uni-Free Flow inside: Polini Sport Clutch: Stock Vario/9g: Custom LED Blinkers: Yes, its fast; No, you can't ride it! I can't thank this place enough. I've only owned one other scoot in my life (Honda Aero) and that was purely to get on a go. But this was the first time for a lot of things when it comes to actually building anything mechanical. So like a bunch of others here, I'm proof that with the help and knowledge found on this site, you too can build yourself something to be proud of. If it's a complete overhaul like mine, a sick racing machine like some of the other more advanced characters around here, or even something as simple as a throttle mod, you can find everything you need right here!! Nice report and pics Chris. Love those hand guards!!! Will stock 125 units fit on a 50cc scooter w/out any mods? If so, which model yr will fit on a 2005 Zuma? Keep up the great work!!! Well done sir....now sit back and look at what you have accomplished. Its a good feeling huh??!! You can always look out at it and say....I did that. No one can take that away from you!